Take a look at these cookies. Can you tell what tool I used to make the designs? The designs are all sort of different, right? But it's just one tool. Not a skewer. Not something that I had to press over and over. Just one tool that made a bunch of different patterns. The recipe I was working with called for marking the tops of the cookies with a fork, like you'd do with peanut butter cookies. I started reaching for a fork to mark the cookies, and ... I just couldn't. In my mind, that crosshatch pattern belongs on peanut butter cookies. I had to use something else. I peered around the kitchen, and then I spotted it. The perfect tool. I'm sure you have one in your kitchen. Should I tell you, or keep you hanging a little longer? The cookbook that this cookie recipe was from was Food & Wine Best of the Best, volume 16. The book is a compilation of recipes from different cookbooks, but this particular recipe was actually an exclusive in Best of the Best. It was from the authors of The Back in the Day Bakery Cookbook by Cheryl and Griffith Day, and that book is one of the ones that's featured in Best of the Best. The book is one that's been making the rounds in the Cook My Book group, and most of the cooks have loved it. Funny thing is that most of the recipes I bookmarked were baking recipes, including two different cookies. This was the first cookie recipe I tried, and I really like it. I might actually buy the book. Or maybe both of them. The interesting thing about these cookies is their texture. It reminds me of the Chinese almond cookies I used to get from one of my favorite take-out restaurants when I lived in Chicago, and I've been trying to find a cookie recipe that would create a cookie with that particular texture. Up until now, I haven't had any luck, but these are pretty close. I think my next batch will include some almond extract, and perhaps even some almond meal. If it works, I'll be a very happy cookie muncher. I made a few minor changes to the recipe. I added the 1/2 teaspoon of salt, since the recipe didn't include any; I used the culinary brandy instead of vanilla extract; and I used macadamia oil instead of the vegetable oil that was called for. Beat the butter, sugar and brandy (or vanilla extract, if you prefer) at medium speed in a medium bowl with an electric mixer or a stand mixer fitted with the paddle attachment. Beat for a few minutes, until the mixture is fluffy. Use a small scoop to form balls of dough, and place them on the baking sheets, leaving room between them to spread. (I put 12 cookies on each sheet and had enough dough left for another 6 cookies.) 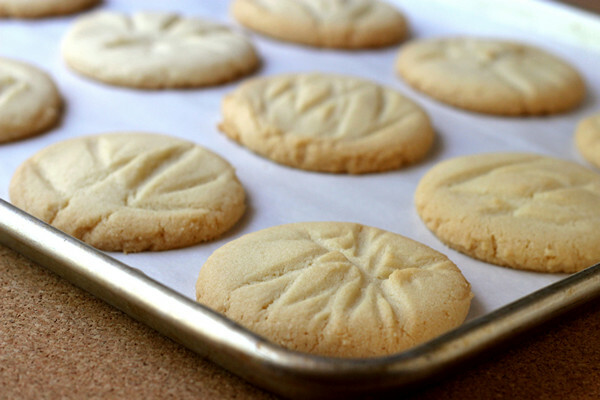 Flatten the cookies with the palm of your hand, then use a whisk to create an indented pattern on top of the cookies. Bake at 350 degrees until the cookies are lightly browned, about 15 minutes. If you're baking 2 sheets of cookies at a time, you'll probably want to swap them around after about 10 minutes of baking.